Hi! I'm about to switch to a new iPhone, replacing the old one. But before doing this I'm afraid if I can get my WhatsApp to this new phone without the use of iTunes as it is useless when it comes to selective transfer of data. Can anyone tell me how to transfer WhatsApp from iPhone to iPhone without iTunes so that I can transfer only WhatsApp? Thanks in advance! This question has a positive answer. We are going to discuss three different ways which will give you an exposure on how to transfer WhatsApp from iPhone to iPhone without iTunes. Keep reading and solve your query here. The best way to transfer WhatsApp from iPhone to iPhone without iTunes is taking the help of iMyFone D-Port Pro. This is the best backup and restore tool that works in an impressive way. The special thing about this program is helping you with selective backup and restore of iPhone. Putting differently, it's up to you to decide if you want fullly or partially backup and restore iPhone. You should not doubt on its compatibility, iMyFone D-Port Pro shows total compatibility with latest iPhones and iOS 11.3, and it works on both Windows and Mac computers. You can rely on this program for its full safety. Let us now understand how you can transfer WhatsApp from iPhone to iPhone without iTunes using this tool. 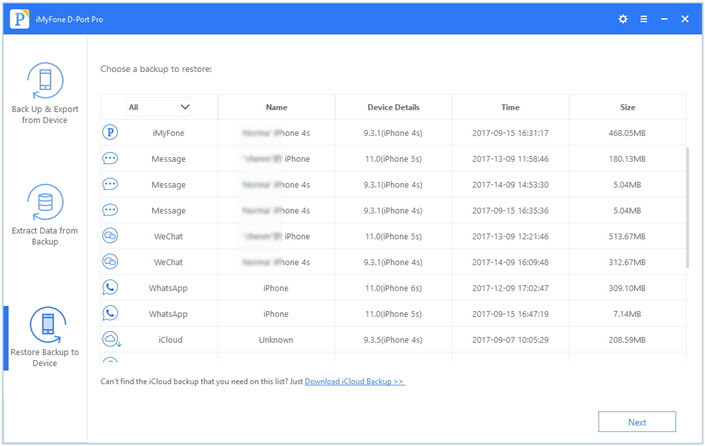 If you have an iCloud or iTunes backup, you can use iMyFone D-Port Pro to restore only WhatsApp data to your iPhone. The steps are almost the same. You just need to choose an iTunes or iCloud backup at the beginning, and then follow the on-screen prompts. Step 1: Launch the program in your PC and click on 'Restore Backup to Device' option given on the left panel. A list of backup files will appear on the next screen. Choose the desired iCloud backup file and proceed to clicking on 'Next'. You can click on 'Download iCloud Backup' hyperlink given at the bottom of the list. 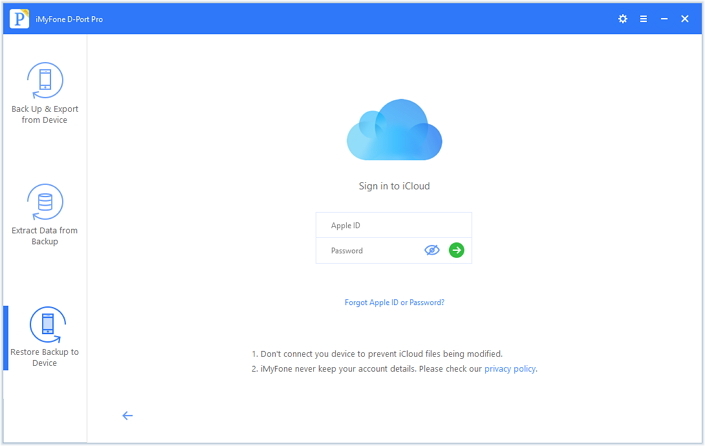 Step 2: Now, you need to login to iCloud account and you can find your backups in the account. Step 3: Pick out the one you wish to restore and hit on 'Next'. Choose the 'WhatsApp' option now and click on 'Next' to let the program scan the app. Step 4: After scanning, the program will show you your data in the backup so that you can preview it. 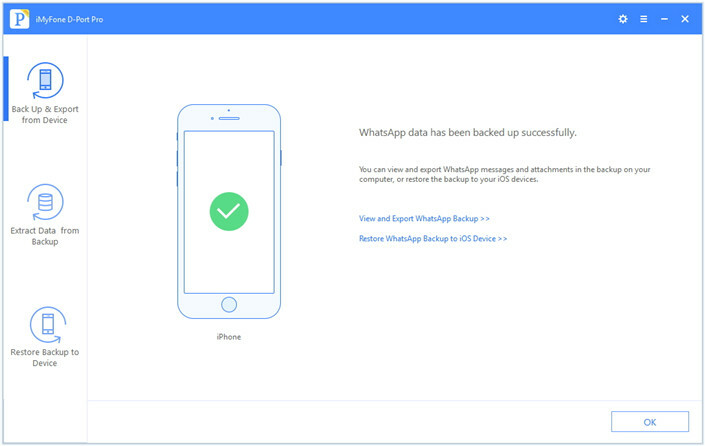 After previewing, hit on 'Restore' and your WhatsApp will be transferred successfully to your device. You need to take backup of your WhatsApp first if you haven't any backup. Follow the steps given below. Step 1: Launch the program and connect your old iPhone to PC. 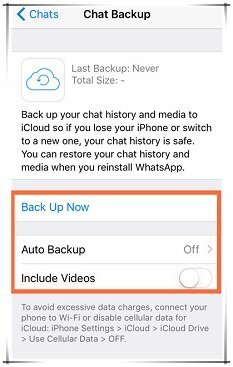 Click on 'Back Up & Export from Device' and then hit on 'Back Up WhatsApp'. 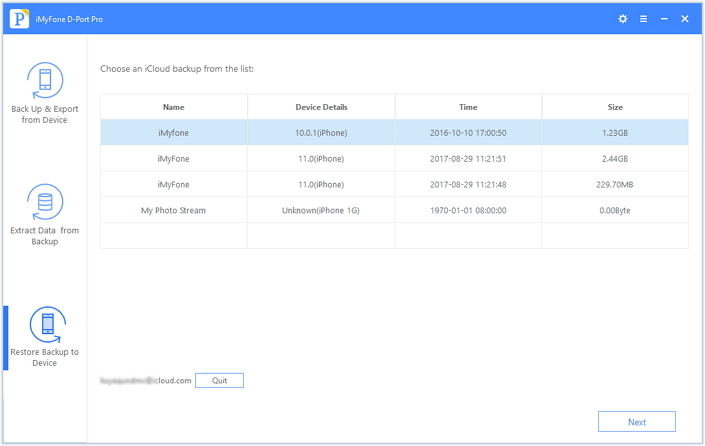 Start making backup by clicking on 'Backup' and keep the device connected during the whole process. 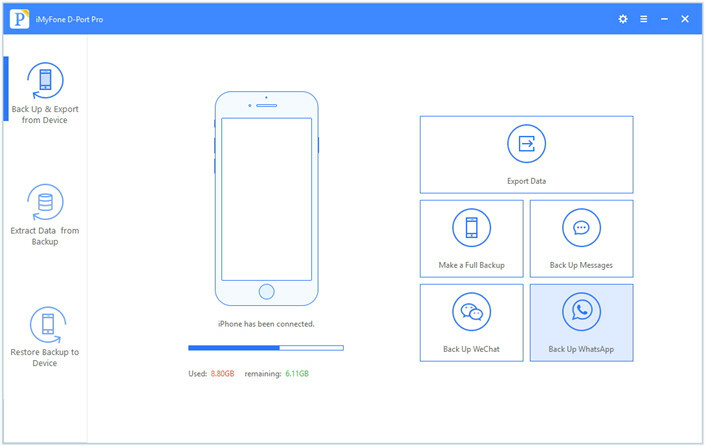 Step 2: Now, connect the new iPhone and click on 'Restore Backup to Device' tab and choose the backup file you've just made. Hit 'Next' and the tool will start scanning the data contained in it. Step 3: As soon as the scanning gets over, the list of data items will be displayed in the next page. Simply click 'Restore' and then tap 'Done' when the restore process is complete. If you wish to transfer WhatsApp from iPhone to iPhone without iTunes, another of the ways you can try is iCloud. 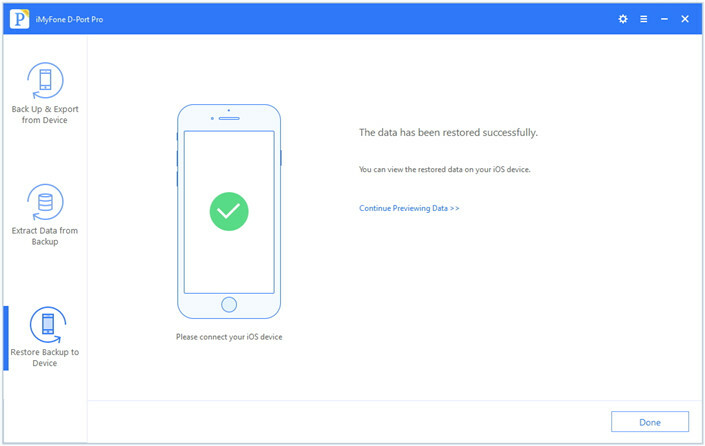 Many iOS users use this service for backing up their data. iCloud takes a strong internet connection for a smooth process. Also, please bear in mind that iCloud offers only 5GB of free storage. If you want to save the data beyond this storage, you will need to purchase more. The steps for transferring WhatsApp through iCloud are given below. In your iOS device, open 'WhatsApp'. Go to 'Settings' and tap on 'Chats'. Now, choose 'Chat Backup' followed by 'Back Up Now'. You can notice 'Auto Backup' option. This feature can help you to schedule your backup by setting a preferred frequency. You can also decide whether you wish to include videos in your backup or not by toggling 'Include Videos' button on or off. After choosing everything, your backup will begin and will complete on the basis of your internet and data size. Once the backup is made, it's time to transfer WhatsApp from iPhone to iPhone. Take your new iPhone and install WhatsApp from the App Store. 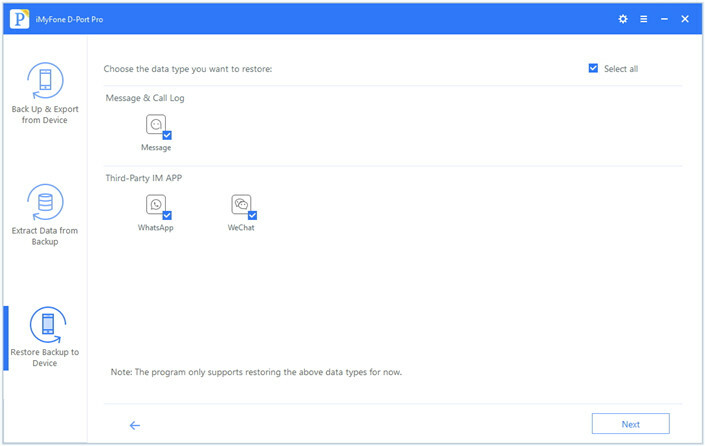 Enter WhatsApp details by logging in with the same phone number and verifying OTP. Next, follow the instructions and restore your WhatsApp chats in your new phone. This way your WhatsApp will get transferred to the new phone. The last method to learn how to transfer WhatsApp from iPhone to iPhone without iTunes is emailing your chat history. Without further ado, we would like to state the tutorial. Check out the steps below. Open 'WhatsApp' in your old iPhone and select any of the chat, be it an individual or a group chat. 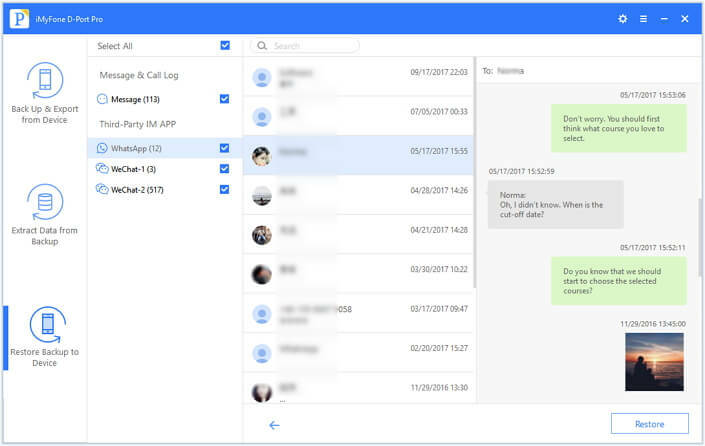 Now, look for the contact or group name at the top and tap on it. 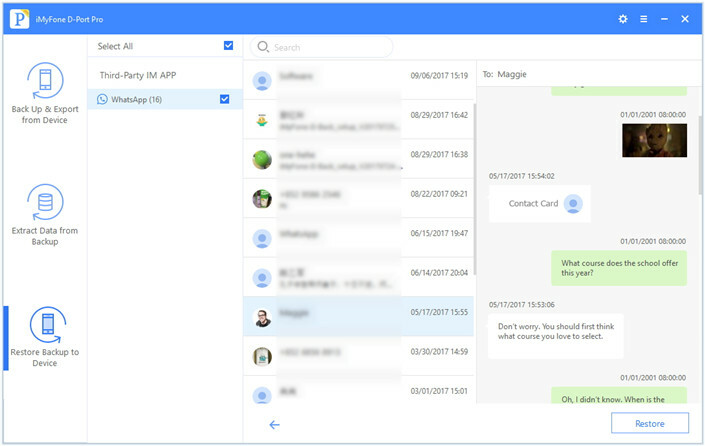 You will be able to see the contact/group info at your screen. Scroll a little down and hit on the 'Export Chat' option. You will be asked to email the chats with media or without media. Tap on 'Attach Media' if you desire to get the media files transferred to your new device otherwise tap on 'Without Media'. Lastly, enter the correct Email ID and just tap on 'Send'.